Every film you see in movie theatres has gone through dozens of approval stages before it ever hits your local cinema. To make it onto the big screen, the studio bosses have to feel this is actually a movie that can make back the millions of dollars they’re going to spend on promotion and publicity. In looking at a movie like The Eye though, you have to wonder what these studio executives are drinking when they approve films. On the bright side, The Eye is a remake of a Hong Kong horror film, and the success of remakes like The Ring and The Grudge prove that audiences love these kinds of horror films. There’s a definite down-point for The Eye though, and that’s the fact that it was re-written by the same person who gave us such mind-numbing scripts as Snakes on a Plane and Gothika. There is also something to be said for casting, and I am of the opinion that star Jessica Alba couldn’t act her pretty little face out of a children’s theatre school. She draws audiences into theatres and she looks good, but she is not what I would ever call a very good actress. 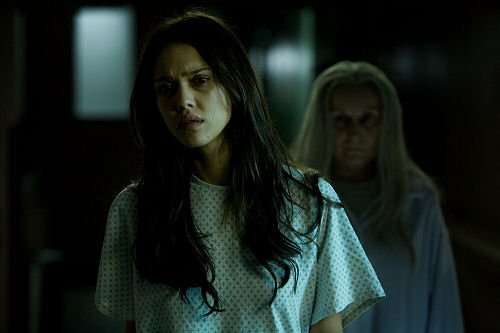 In The Eye Jessica Alba plays Sydney Wells, a violinist who has been blind since she was a child. With the help of a good doctor, she has surgery to help her see again, thanks to a double corneal transplant. The only problem is that, although she can finally see again, she is also seeing horrifying things, and she can’t tell if they’re real or just her imagination haunting her. The film definitely promises a few mindless chills for anyone looking for a bit of horror, and Alba can certainly hold her own as long as she just has to be a bit cute, cry a little, and try to look scared. Following up our week of awful movies, Strange Wilderness follows a bunch of moronic guys as they struggle to keep a wildlife show alive. As always in any comedy like this, someone comes up with an ingenious plan that will lead to hijinks, and hopefully, Bigfoot. Since the film was written and directed by Fred Wolf, the same writer who brought us Without a Paddle and Joe Dirt, it’s safe to say that if you got a kick out of those films, you’ll like this one too. For anyone else, Strange Wilderness looks worse than getting a root canal without anaesthetic. And finally, rounding out the vapid films this week is a slightly less repulsive looking movie about, well, a dead fiancÃ©e. A year ago Kate, played by Eva Longoria Parker, was killed on her wedding day and Henry, played by Paul Rudd, still hasn’t gotten over her death. When his sister decides it is time Henry moves on with his life, she takes him to see Ashley the psychic and convinces her to make him get over Kate. With romance on the line, there is just one catch – Henry’s fiancÃ©e is haunting Ashley. Finally, if your children haven’t convinced you to hand over all your cash yet for Hannah Montana stuff, here is your chance to give Disney a little bit more of your hard-earned money. With Miley Cyrus on stage in a full 3-D experience, the young fans out there will probably love the chance to see their favorite star on the big screen.